Does it ever make sense to cut price? Benchmarks, surveys, and market comparisons are useful for indicating how well a firm is doing against a standard set of external norms. To complete a thorough competitive analysis, we recommend that law firms supplement these external data with a strategic profit analysis. Firms that know how to meet client needs efficiently enjoy a competitive advantage over less informed competitors. Efficient firms can confidently consider new fee agreements with clients. In our experience, the most effective way to highlight the value of these advanced measurements is through an example. If you have been following our previous posts in this series, you will recognize the data presented below. If not, you can follow along from here and still benefit from the discussion. All of your previous posts are included on our blog and will be available in an eBook when the series is complete. The partner responsible for Practice 2 has been approached by her Client 2 with a new fee proposal. The client has proposed increasing the current volume of work sent to the firm by 25 % in exchange for blended billing rate of 225 per hour for all attorneys. The client has placed no restrictions on staffing beyond being qualified to provide the services. Table 1 provides the existing client level profitability detail for Client 2. Will the rate decrease to the current partner (225 from 294) rate be offset by the increased associate rate (225 from 210)? Will the increased volume lead to enough profit to compensate for the changes in rate? What is the planned post-proposal staffing solution? What impact does the increased volume have on payroll and overhead costs per hour? What impact does the increased overhead absorption have on overall payroll and overhead cost per hour that applies to all of Practice 2’s clients? If the cost per hour impact is favorable, are the incremental profits attributable to Clients 1 and 3 enough to offset any lost potential profit on Client 2’s work? What are the intangible impacts of the post-proposal staffing solution? Will another staffing solution work? Answering these questions will require several pieces of data. Fortunately, this firm has current client profitability detail and can respond to their client’s request quickly. Table 2 below provides a recap of existing profitability for all Practice 2 clients. Practice 2 currently generates 900,000 in fee revenue with a profit margin of 33.91%. Reviewing the individual client results indicates that Client 2 is producing 334,500 in fees, 119,868 in profit, and a margin of 35.83%. What is the planned post proposal staffing solution? After analyzing the nature of Client 2’s work and reviewing existing workloads, Partner 3 believes that she can work 90% of the increased hours and that Associate 6 can supply the remaining 10%. Recall that this proposal includes a blended rate agreement and the client has placed no restrictions on staffing. Recall that the client has proposed a volume increase of 25%, which equates to 333.50 additional billable hours. See Table 1 for the current hours and compare to the new agreement hours in Table 3. See Table 1 for the current hours and comparison to the new agreement hours in Table 3. Using the staffing model developed by Partner 3, Table 4 indicates the increased hours needed from Partner 3 and Associate 6. Partner 3 must carefully consider the impact of increasing her billable hours to near full capacity. We will discuss this solution more as we progress with the analysis. In this example, Partner 3 will increase her annual billable hours to 2,010 from 1,710, or by 17.54%. Associate 6, will only need to raise production by 33 hours. Note, however, that Associate 6’s current hours are essentially at maximum. In this example, partner pay fluctuates based on revenue produced (35%), which would result in a reduced cost per hour related to the new billing rate proposal. Assume fixed associate pay, which allows an increase in production to reduce hourly costs. Please review our earlier piece for more information for computing cost per hour. Table 5 indicates the impact on cost per hour related to the proposed volume increase. Notice that Partner 3’s combined cost per hour has dropped to 169.04 from 209.08 and Associate 6’s cost per hour has dropped only slightly from 113.99 to 112.33. Remember these cost per hour improvements as we progress through the analysis. For help with her decision, Partner 3 can now apply this updated cost information to Client 2’s profitability. Will the rate decrease to the current partner (225 from 294) billing rate be offset by the increased associate rate (225 from 210)? Having experienced both good and bad results with a strategy that includes cutting the price to grow volume, it is imperative that a firm has a quality cost accounting and estimating process. As can be seen in Table 6 below, Client 2’s proposal generates 40,688 in additional fees and 13,219 in new profits (32%). On the surface, this offering appears to be workable, but a analyzing profitability on a deeper level is necessary to understand the profit contribution fully. Table 7 compares before and after detail about timekeeper results. Partner 3 contributes 300 more hours but generates a negative 1,984 in profits (the additional volume does not overcome her rate cut). Associate 6 creates 15,203 in new profit. Due to the fixed nature of Associate 6's costs, essentially all of his incremental fees results in new net income. Is the client’s proposal negotiable? Is the client’s proposal an opportunity for a competitor? Will other staffing solutions be more effective? Is Partner 3 locking herself it to a long term lower billing rate? What other prospects for new business are available? 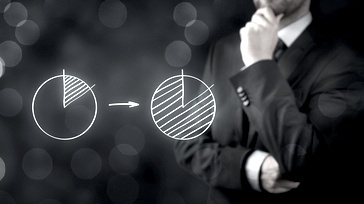 What is the impact on the profitability of Partner 3’s Client 1 and Client 3? Partner 3 decides that she will benefit from understanding how the increased hours and lower per hour costs impact her other clients. She wants to be firm footing before risking a potential competitive challenge for Client 2’s account. 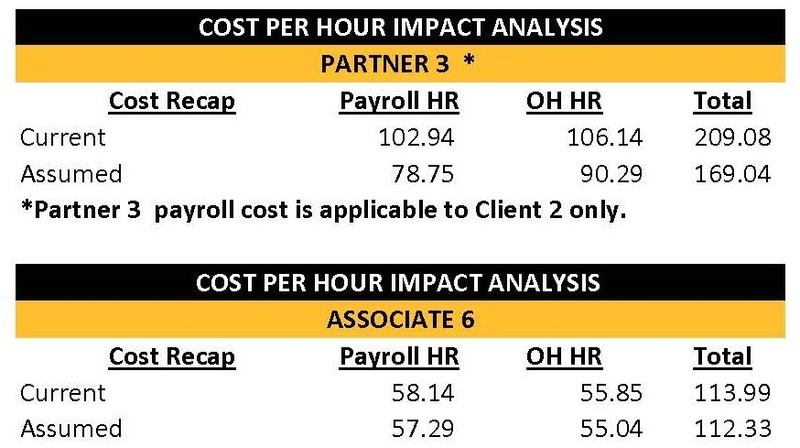 What impact does the increased overhead absorption have on overall payroll and overhead cost per hour that is applicable to all of Practice 2’s clients? Given the existing information, it is not hard to determine how the reduced costs per hour, which apply to all clients for these timekeepers, impact the overall profitability of Practice 2. Table 7 compares the pre and post proposal results for clients 1 and 3. Client 1’s and 3’s profitability improves by 7,113 and 12,031 respectively. The profit improvements come from a small reduction in payroll costs per hours and a larger reduction (6.46-8.53) in overhead per hour. Making a decision to accept, counter-proposing or rejecting Client 2’s proposal is not an easy one. Recall from Table 2, Client 2 represents almost 40% of Partner 3’s current profit and is likely responsible a corresponding amount of Partner 3’s income. Associate 2 derives 1/3 of his billable hours from Client 2. Finally, Client 2 absorbs about $106,000 in overhead, much of it fixed, presently. Table 9 provides and a recap of before and after profit elements for all clients. Finally, Partner 3 may want to assess the potential impact of Client 2’s proposal on her personal income. Assume that timekeeper collections have a material impact on compensation. Table 10, indicates that Client 2’s proposed rate plan will only result in 8,009 more in timekeeper compensation credit – 300 hours for 8,009 in additional compensation credit. When faced with a result such as this one, those other questions become more consequential. Partner 3 now knows that Client 2’s proposal will increase her practice’s profit by $33,504. She realizes that her production model is heavily reliant on an increased personal effort from her. She understands the potential impact on her compensation and She has a model that she can use to try different staffing and pricing scenarios. Finally, this methodology will inform any future negotiations with Client 2. Our next post will focus on what is a profit analysis and how to use law firm profitability data in compensation.